Chittaprosad Bhattacharya was in his twenties when he experienced the Bengal famine first-hand as a resident of the eastern province in British India. Chittaprosad’s watercolour and linocut prints at Kochi-Muziris Biennale 2018. KOCHI: Chittaprosad Bhattacharya was in his twenties when he experienced the Bengal famine first-hand as a resident of the eastern province in British India. The scenes of widespread deaths owing to starvation, coupled with epidemic, and forced migration, shook him to the extent that the artist became even more honest by drawing stark drawings and sketches on the human suffering. A display of some of the works of Chittaprosad is on at the Kochi-Muziris Biennale. They are a stark reminder of the trauma the rural poor underwent in one of the world’s biggest manmade tragedies that claimed almost 30 lakh lives during 1942-43. As someone who avoided oil-on-canvas, Chittaprosad’s watercolour and linocut prints at the Durbar Hall Gallery in downtown Ernakulam are significant. The body of work at the ongoing fourth edition of the 108-day biennale further comprises the artist’s experiments with political cartoons that critique the post-Independence nation-state and its policies. It was precisely this ‘audacity’ that prompted the imperial British to seize certain pivotal Chittaprosad works and even destroy them. For, the profuse sketches in black-and-white, along with reports, were published in local newspapers, culminating in a report titled ‘Hungry Bengal’. Also, a poet and storyteller, Chittaprosad (1915-78) was an active member of the Communist Party of India. That way, he drew added inspiration from village sculptors, artisans and puppeteers far and near his native Naihati in the neighbourhood of Kolkata.A human face to a ribcage. That’s how Chittaprosad tends to epitomise the Bengal famine, going by one of his works at the Biennale. His deep faith in the Communist ideology is evident from his works that lead up to India’s independence in 1947. This is particularly clear from the images the artist did, inspired by the Royal Indian Navy Revolt of early 1946 when sailors of the country on board ship and Bombay harbour’s shore establishments struck work in a stir that soon found support from fellow labourers from Karachi to Calcutta. The agitation, which had full support from the CPI (amid condemnation from the Indian National Congress and the Muslim League), killed eight workers and wounded 33 others before the British repressed it. Chittaprosad’s post-Independence drawings were largely against neocolonialism, where he sensed capitalism indirectly retaining hold over developing countries. His works went on to laud anti-American collectives and movements within India even as his works criticised the way governments in the country were siding with Western powers. Not just them, the biennale segment shows Chittaprosad’s writings published in the CPI(Maoist)’s People’s War magazine. The archival material on display also includes photos of Chittaprosad with his friends and family.The artist had, in 1949, quit the CPI, citing differences with the party’s policies. He had thence worked for universal humanism, global peace and eradication of poverty from the planet. 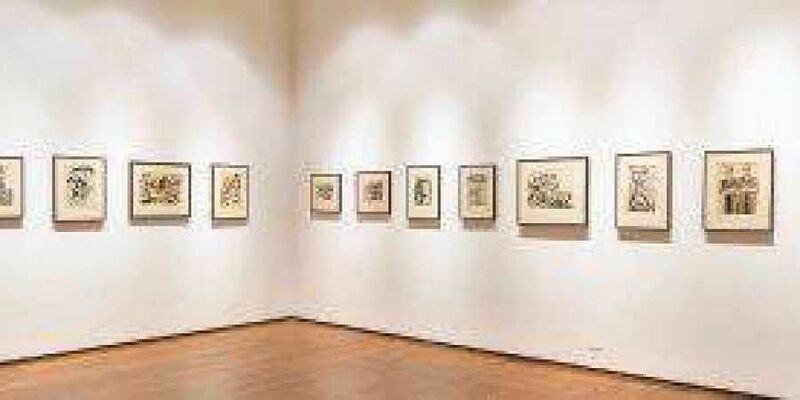 All these lent fresh dimensions to Chittaprosad’s stature as one of India’s foremost modern artists. His works have found venues in National Gallery at Prague and the National Gallery of Modern Art in New Delhi.